With the new update of Destiny 2: Season of the Drifter, a lot of new weapons have added in the game. The new update does not only just contain weapons, there are also new gears and interesting side quests as well. But primarily the update contains three new Pinnacle weapons including 21% Delirium. Those of you who don’t have the faintest idea what a Pinnacle weapon is; these are the best weapons in the game that you can get your hand on. Fully masterworked and loaded with perks, these weapons are ideal to wreak havoc on enemies in pretty much every situation. 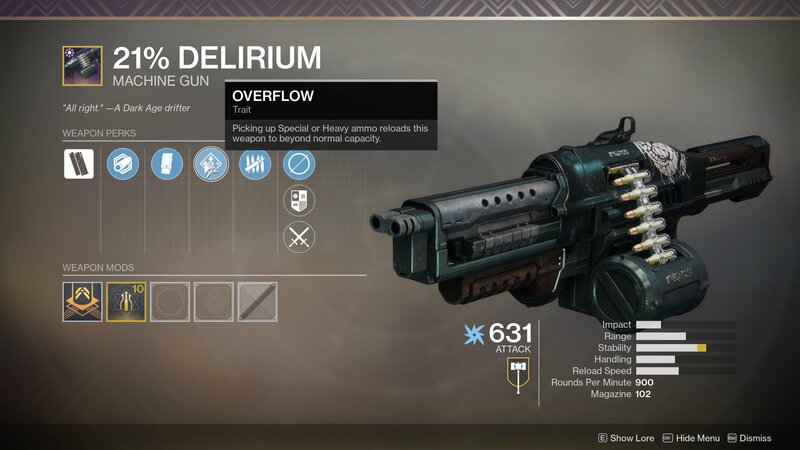 Destiny 2 have added three Pinnacle weapons in the game but it looks like players are going to like 21% Delirium the most. We are certainly not discouraging players that are going after other two weapons Oxygen SR3 and The Recluse, we just think that 21% Delirium has the potential to become favorite amongst players as compare to its competitors. Similar to other two Pinnacle weapons, this gun requires you to complete a long quest including sub-missions. Start the quest by visiting The Drifter in the Tower. Accept the mission “By Your Bootstraps”. This will add the mission to your inventory tab. This mission will require you to complete Notorious Hustle Triumph. You can complete first two steps by simply playing gambit. Don’t worry, just keep playing Gambit challenges and bounties and with time these two challenges will complete automatically. The third task is a bit of problem. It will require some hard work. Resetting the Infamy rank will take not days but weeks to complete. Your Infamy rank levels up as you play gambit bounties but reaching the maximum Infamy level may take some time. Fortunately, the challenge is not difficult just time consuming. We can say with some confidence that after completing this quest, when you play with 21% Delirium, you’ll thank us. The Machine Gun comes with two great perks: Overflow and Killing Tally. These perks will increase the ammo capacity of the gun and will also improve the maximum damage delivered by it.